Gee, I got old. Twentieth anniversaries of records I bought as a teenage will start coming thick and fast now. Some I’ll write about fondly; others I might listen to and wonder what the hell I saw in this music. But, and this I can guarantee, it’ll be with a where-did-the-time-go bewilderment. So Foo Fighters, then. 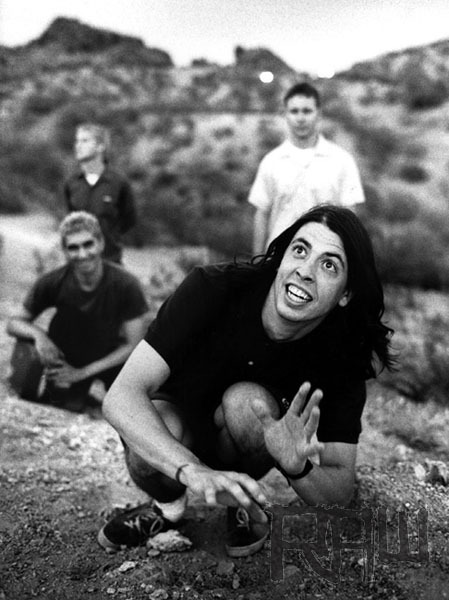 Nowadays the acceptable face of mainstream rock and professional nice guy, albeit one with enough self-regard to deem the fact that he’s making a new record worthy of an 8-part HBO series full of slo-mo shots of the band walking purposefully, Dave Grohl didn’t always have quite such an assured position in the world. In 1995, still processing Kurt Cobain’s death, Grohl didn’t know how to proceed (I assume anyone reading this knows Grohl played drums in Nirvana, right? OK, sorry. Of course). Like many musicians who go through a trauma, for a while he didn’t want to hear music, let alone play it. It reminded him of everything that had happened. And while he’d made good money from Nirvana and could afford to live quietly, take his time and see what came his way, he was still only 26, had a lot of working years ahead of him and not much idea of how to fill them. Eventually, as the pain subsided into an ache, Grohl decided to treat himself to a week in a 24-track studio, Robert Lang’s, not far from where he lived in Seattle. If Lang’s isn’t the biggest name in studioland, with a Studer A827 tape machine and an SSL E series desk, it was still a major facility, so it was no small present Grohl was giving himself. Nonetheless, essentially he was just doing a more hi-fi version of something he’d done a few years before in 1992, when he recorded a collection of songs by himself and gave them to some friends in Virginia to release on their cassette label, Simple Machines. Pocketwatch, which has since been endlessly bootlegged, came out under the pseudonym Late! (Groh’s exclamation mark). He was planning to do the same thing again: release it under a band name, keep his own name off the sleeve and let the album find whatever audience it could. Somewhere over the next 10 years, the group slowly became one of the biggest in the world, and even now Grohl can turn out a strong single or two on each record, but I checked out a long time back.I find the sound of his albums, with the exceptions of the debut and 1999’s vintagey There is Nothing Left to Lose, extremely sonically fatiguing. The worst offenders, The Colour & the Shape and One by One, are essentially unlistenable, with the massed overdubs of guitars forcing the drums to occupy ever smaller real estate, until they no longer retain any of the shape of a real-life drum performance. This is crucial to a good-sounding, good-feeling, rock record (the Butch Vig-produced Wasting Light is a partial exception to this trend; it sounds, well, OK). And Grohl’s grandiosity and general unwillingness to challenge his audience has resulted in a lot of play-it-safe soundalike songs. But I remain hugely fond of his debut, so distinct from the rest of the group’s music that it’s really the work of a different artist. The medium-fi recording, noticeably lacking in low end and bass guitar, is hugely charming, Grohl’s drum performances have room to breathe, and the material whether goofy (Weenie Beenie, Wattershed, This is a Call) or otherwise (Exhausted, I’ll Stick Around) is strong, and benefits from the low-key vibe. Each song sounds better in the context of all the others. It’s a great collection of songs; later Grohl records have striven to be a collection of great songs. Much harder to do the latter well. You couldn’t make this record better by adding or subtracting anything. I should admit, too, that at 13 I found the idea that one man did all this by himself (playing the drums! and the bass! and the guitars! and singing it! and writing all the songs!) to be hugely inspiring. This entry was posted in Music and tagged 1990s, alternative rock, Barrett Jones, Butch Vig, Dave Grohl, Eddie Vedder, Elliott Smith, Exhausted, Foo Fighters, foo fighters twentieth anniversary, grunge, HBO, I'll Stick Around, Kurt Cobain, Late!, Nirvana, Nothing Left to Lose, One by One, one-man band, Pocketwatch, Rob Schnapf, Robert Lang's, Simple Machines, Sonic Highways, SSL desk, Studer tape machine, This is a Call, Tom Rothrock, Wasting Light, Wattershed, Weenie Beenie, XO on June 27, 2015 by rossjpalmer.